Greetings again from the darkness. Filmmaker Dan Gilroy has distinct ideas on how to make his movie stand out from the cluttered maze of Netflix: give elitists a violent comeuppance, and allow Jake Gyllenhaal the freedom to take his character over the top. Not only has Mr. Gilroy reunited with Mr. Gyllenhaal and Rene Russo, his leads from the excellent NIGHTCRAWLER (2014), but he has also assembled a deep and terrific ensemble of actors who understand exactly how to present the material … even if some viewers will be confused, startled, or unimpressed. What begins as a parody of the highfalutin contemporary art world, slowly transforms into a satirical-supernatural-horror film that judges severely those who drive the profit train by peddling art. Morf Vandewalt (Gyllenhaal) is the flamboyant art critic who possesses God-like abilities to make or break an artist with the words he chooses for his reviews. His work often intersects with Rhodora Haze (Ms. Russo), who runs the largest gallery in the city. She was once part of a punk rock band (from which the film takes its title), and now she lives to cash in on the work of others. As she so eloquently describes, she has moved “from anarchist to purveyor of good taste”. Other players include Jon Dondon (Tom Sturridge) as Rhodora’s competitor, Gretchen (Toni Collette) as an agent, Bryson (Billy Magnussen) as a whip smart handyman, Coco (Natalia Dyer) as a Midwestern girl trying to make it in the big city, Piers (John Malkovich) as a blocked artist who regrets quitting drinking, Damrish (Daveed Diggs) as an up and coming artist, and Josephina (Zawe Ashton) as Rhodora’s ambitious assistant. The story shifts tone when Josephina discovers the artwork left behind when her reclusive elderly neighbor Mr. Dease dies suddenly. Dease is unknown as an artist and was in the process of destroying his life’s work when he died … he wanted no part of the art world, other than creating his own work. Josephina seizes on this opportunity and works with Rhodora in representing the work of this “hot” artist. As the work is monetized, the supernatural forces take over – often in quite violent ways. The players are so focused on how to capitalize on the work, it takes them an inordinate amount of time to realize evil forces are afoot. No one escapes scrutiny: artists, critics, agents, or collectors. In cinema, if you choose to go bat**** crazy, it’s best to not hold back. Gyllenhaal plays Mort full tilt and he’s immensely fun to watch. The extraordinary ensemble cast benefits from some unusual and vivid imagery supported by expert cinematography from Oscar winner Robert Elswit (THERE WILL BE BLOOD). 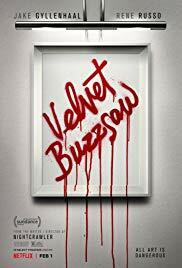 It’s rare for so much social commentary to be included in a project that could easily be compared to a teen slasher. There is some excellent dark humor, though maybe not quite enough, and two art exhibits in particular are memorable: Hoboman, and the Sphere. There are some clear cut groups of people in the film: the hot youngsters (Josephina, Dondon, Damrish) vs. the establishment (Mort, Rhodora, Piers) vs. misguided wannabes (Gretchen, Coco, Bryson). No matter their approach, one of the messages shines through – artists invest their soul into their work and that often stands in direct conflict with the other side of money and commerce. We can be a bit forgiving the film’s faults given the ambitious nature of the project; just be cautious of the monkeys in the mirror. Greetings again from the darkness. I will forever carry this flame of hope for quality horror films since they were such a part of my childhood movie watching. It’s such an odd genre because the really good ones are quite rare, but the category in general is quite profitable. We enjoy being frightened and stressed … in the safety of a dark movie theatre with a few dozen fellow movie goers. This debut feature film from writer/director Ari Aster is filled with foreboding and dread – key elements to a successful horror film. 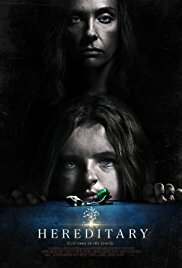 The clever filmmaker spends the first portion of the movie tricking/manipulating us into thinking this is going to be a “normal” ghost story – one we’ve seen before, albeit with a stronger than usual cast. Time and again I found myself thinking “this poor family”. Toni Collette plays Annie, mother of son Peter (Alex Wolff, brother to Nat and son of Polly Draper) and daughter Charlie (Milly Shapiro), and wife of Steve (Gabriel Byrne). Some scenes are loaded with realistic family banter – the kind that’s a bit passive-aggressive and judgmental in tone. This adds to the unsettling mood of dread that cloaks most of the characters and most every scene. Annie is an artist who creates miniature settings, and once she unloads her family history on an unsuspecting group therapy session, we are provided a big clue, as well as confirmation that the bad times aren’t over. When tragedy strikes again, the family seems beyond repair, as do the individuals. Peter is a seemingly normal teenage boy who likes to smoke weed, and dutifully lets his little (and slightly disturbed) sister Charlie tag along to a party since his mother asked. Ms. Shapiro is a revolution in the role – somehow simultaneously both creepy and sympathetic. Father and husband Steve is very patient, a trait that rarely pays off in horror films. The family house makes for a terrific setting, especially considering the impressive treehouse that seems to always require a space heater. Ms. Collette fully commits to the role with all its grief and terror. It’s really her performance combined with a creative story that harkens back to THE EXORCIST and ROSEMARY’S BABY, that allow the film to click. By the end, this family only wishes they were in a “normal” ghost story. And as a reminder, if you are born into a family where one member has a sleep-walking incident similar to what’s described here, you have every right to lock your door before going to sleep – that is, assuming you could ever sleep again. Greetings again from the darkness. Billed as a comedy, the movie will leave most viewers wondering wherefore art the laughs. Filmmaker Emanuel Hoss-Desmarais and his co-writer Marc Tulin aim high with a grown-up level look at the trials and tribulations of parenting – complicated here by a science experiment gone awry. Matthew Goode plays Ben, the son of a long line of renowned scientists, and Toni Collette plays Catherine, the daughter of two noted physicists. The two nerds (a term of admiration) meet in graduate school, fall in love, and hatch a plan to conduct a revolutionary sociological scientific experiment. In 1977 they convince an arrogant and glory-seeking rich guy named Gertz (Michael Smiley) to fund an experiment with a premise that boils down to their intention of settling the nature vs. nurture debate once and for all. 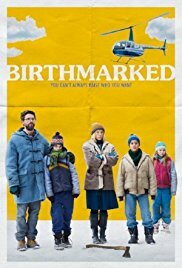 Ben and Catherine plan to take their biological son Luke and turn him into an artist, while at the same time raising two adopted kids contrary to their genetic heritage. Maya, born into a family of “nitwits” will be raised as a Brainiac, while Maurice, born into a violent household, will be developed as a pacifist. It’s an interesting set-up that also includes Russian athlete Samsonov (Andreas Apergis) as their live-in caregiver/nanny, and Mrs. Tridek (Fionnula Flanagan) as Gertz’s well-meaning assistant. The story jumps ahead to 1989 when Gertz arrives for the 12 year check-up and evaluation. When he deems the children to be “average”, Ben and Catherine are devastated. Gertz threatens them with bankruptcy if the experiment isn’t successfully expedited so he can publish the desired results. Mrs. Tridek also functions as the narrator who fills in the gaps with some details that might ordinarily leave us a bit confused. Predictability rears its ugly head in the final act, and the film slips into more traditional cinematic story-telling and characterizations. Emotions and greed are the natural responses to the deception that has occurred, and while the adults leave us disappointed, it’s at this point where the story finally shifts to the kids and we get to see the winner in the nature vs. nurture battle. Where the film works best is in its look at just how powerful and overwhelming parenting can be, regardless of the brain power and intentions one brings to the situation. Toss in some greed and the power of biology, and the final analysis can’t be shocking, even if the film itself doesn’t quite live up to its premise. Greetings again from the darkness. The theatre was filled with the sounds of sobbing. And by sobbing, I mean bawling … not the typical post-movie sniffles. While I was a little confused on just where my fellow movie watchers thought this story was headed, it’s understandable that sometimes a dark theatre is simply the best place to have a good cry. Director Catherine Hardwicke and screenwriter Morwenna Banks deliver an unfettered look at friendship, sickness and loss … and a reason to bring tissues. Tearjerker movies have quite the history of success. Some of the more popular sob fests include: Love Story, Brian’s Song, Terms of Endearment, Beaches, Steel Magnolias, and The Notebook. This latest is probably most similar to Beaches in that the focus is on two lifelong female friends (polar opposites in personality) who ride the rollercoaster of life together – through good times and bad. 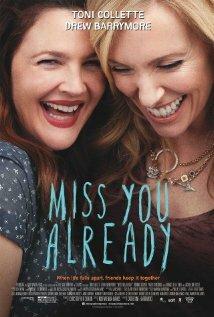 Milly (Toni Collette) and Jess (Drew Barrymore) meet in elementary school and experience many of life’s “firsts” together. We know this because the film begins with a bit of a clumsy flashback sequence that shoots us through their high school years, heavy partying, and finally picks up after they are married. There are many mysteries of the female gender that those of us with Y chromosomes will never comprehend. One of those is the close friendship between the vain, center-of-attention type, and the always supportive enabler. Milly is the classic taker, while Jess is a giver. Milly is the high-flying socialite who dresses flashy and draws a crowd, while Jess is the dependable sidekick, always there to make sure Milly is never alone. It’s confounding and a bit sad to those of us who view friendship as something much different. Both Ms. Collette and Ms. Barrymore are strong in their performances, though Collette has the much meatier role. What’s impressive about the movie is how it takes head on the horrific travails of those with breast cancer. The emotional and physical and medical aspects are all dealt with no compromise. Some of it is tough to watch, but admirable in its directness. Milly’s breast cancer takes center stage, while Jess’ struggle to get pregnant is low-keyed. Fitting for their personalities, but each based in real life sagas. Milly’s husband Kit (Dominic Cooper), and Jess’ husband Jago (Paddy Considine) both provide understandable reactions to the obstacles faced by their spouses. Add in a bleached blonde Jacqueline Bisset as Milly’s eccentric mom, and the five lead actors each contribute a relatable element to the story. Two other actors make an impression: Frances de la Tour as a wise and direct wig-maker, and Tyson Ritter (front man for The All-American Rejects) as a free-spirited bartender who may or may not be a good influence on Milly. Even though Jess is the heart of the story, it’s Milly who dominates … just like their friendship. Green vs glamour. Director Hardwicke will always hold a special place in my movie memories thanks to her sparkling 2003 debut Thirteen. She and writer Banks clearly understand women, and believe it crucial to show the courage required in the fight against breast cancer. Fortunately, their main character is funny and spirited, and pals around with someone we would all be proud to call a friend. And that’s nothing to cry about. Greetings again from the darkness. Don’t you feel sorry for the smart, rich doctor with the beautiful and successful wife, luxury apartment and appointment book full of patients? What about when he loudly humiliates one of those patients for expressing her feelings? We are supposed to want Hector to be happy. But do we? Personally, I didn’t give a rip about Hector. Based on the novel by Francois Lelord, the movie stars Simon Pegg as Hector, a psychiatrist bored with the every day rituals he has set up for himself. A rare two minutes of soul-searching leads Hector to pause his life and embark on a mission to discover the true meaning of happiness. See, Hector believes he can no longer help his patients until he helps himself. My take is that Hector can’t help his patients because he isn’t even trying … he is a narcissist and a jerk who can’t appreciate the moments that make life grand. My disgust towards people like Hector made his journey much less entertaining and enlightening than if the character were someone I cared for. 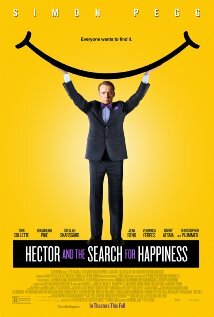 If all that weren’t bad enough, the first person Hector meets on his trip is an obnoxious business man (Stellan Skarsgard) whose key feature is that he is much richer than Hector. The two grown men tour Shanghai and the night is capped with the gift of a prostitute with a heart. This is no spoiler because Hector is the only one who doesn’t know she is a prostitute. After this, he hangs out with Tibetan monks and sets up their Skype (so he can use it). Along the way, Hector’s OCD traits cause him to maintain a journal filled with self-help one-liners and funny drawings of his sights. His spontaneous travel itinerary and endless budget take him next to “Africa” – quotations for the generic and clichéd approach the film provides. When Hector is imprisoned by rebels, there was glimmer of hope for the movie, but soon enough, a previous favor for a drug lord (Jean Reno) pays dividends. Somehow the movie has less insight than the similarly themed EAT PRAY LOVE, and certainly less creativity than The Secret Life of Walter Mitty. Hector’s approach even blatantly borrows from the “Tintin” stories, and makes no apology for doing so. The only moment with any emotional depth comes when Toni Collette lashes out with armchair psychology and tells Hector exactly what he is. In all fairness, the movie is directed by Peter Chelsom, who also directed Hannah Montana: The Movie, so perhaps any expectations were too high. Despite all of the short-comings, I will always pay admission if a movie includes a 3 minute monologue from the great Christopher Plummer, an especially welcome sight here. Simon Pegg, though an incredibly gifted comic actor, is over the top miscast here. His persona is distracting to the point that we never once believe he could be a psychiatrist or that Rosamund Pike would find him appealing. But the single biggest obstacle is that an audience finds it difficult to root for a narcissistic protagonist who believes that there must be some magic potion for happiness … maybe sweet potato stew. Greetings again from the darkness. A Rom-Com for the 50-ish crowd is pretty darn rare. But then, writer/director Nicole Holofcener doesn’t deliver the typical rom-com filled with lame punchlines and actors with perfectly scultped bodies. Instead, James Gandolfini and Julia Louis-Dreyfuss come across as real people with the expected defense mode and vulnerabilities as they try to find intimacy and a personal connection. Albert (Gandolfini) and Eva (Louis-Dreyfuss) meet at a party and subtle sparks fly as both claim they aren’t attracted to anyone at the party. While at the party, Eva, a massage therapist, also meets Marianne (Holofcener regular Catherine Keener), a charming poet who wants to hire Eva to help ease her shoulder pain. Albert and Eva begin dating, and Eva slowly comes around on Albert’s grounded and funny personality. Sure he’s a bit overweight and somewhat slobby, but he treats her well and adores her. Meanwhile, Eva’s massage work on Marianne exposes her to Marianne’s incessant complaining about her overweight and somewhat slobby ex-husband. Yep. This causes quite the dilemma for Eva because she likes Albert and she envies Marianne’s cool lifestyle. Oh and both Eva and Albert have teenage daughters getting ready to go off to college, so the couple also share parent-child separation anxiety. The story clearly centers around Eva, and it’s nice to see Louis-Dreyfuss throttle back a little and avoid some of her sitcom standard moves. We are able to relate to Eva and though we see the corner she is backing herself in to, we also understand how quickly a little bit of poor judgment can spin out of control. Although this is Eva’s story, the real heart of the film is delivered by Gandolfini’s performance. This is no Tony Soprano … this is a real guy … a nice guy … yes, even a sweet guy. Ms. Holofcener has set her precedent with snippy banter from intelligent characters with her previous films Please Give (2010) and Friends With Money (2006), the former I liked very much and the latter I cared little for. This time, all of her characters and their dialogue ring true and are relatable. Eva’s married friends are played by Toni Collette and Ben Falcone (married in real life to Melissa McCarthy) and they have the only hollow sub-plot with their “should we or should we not fire the maid” dilemma. The two teenage daughters are played by Tracey Fairaway and Eve Hewson (Bono‘s daughter) and both have scenes that really strike a chord and ring true. Mr. Gandolfini passed away earlier this year and there was the thought that this would be his final released film. However, it’s been decided that Animal Rescue will be finalized and released in 2014. It’s difficult to watch him and not think what could have been over the next few years, though his legacy is quite secure. His range was much greater than many give him credit for, and I would recommend watching him in both True Romance (1993) and Welcome to the Rileys (2010). Greetings again from the darkness. This is one of those indies that has all the pieces in place to be not just a terrific “little” movie, but also a surprise box office hit. It played well at festivals, critics love it, it has a very talented cast, it mixes humor with human emotion, and the co-directors and co-writers won an Oscar (with Alexander Payne) for writing the script to The Descendants. It even offers the often effective coming-of-age story line in regards to Duncan (played by Liam James) as a miserable 14 year old stuck at a beach house with him mom, her obnoxious boyfriend and his snobby daughter. The movie has a touch of “The Wonder Years” (without the narrator), but it’s a bit more caustic thanks to Steve Carell, who plays Trent, the condescending and bullying boyfriend who has no redeeming qualities that we can see (other than an inherited beach house and a nice tan). It’s very unusual to see Carell in the “bad guy” role, but once you accept it, his lines and lies cut through each scene. Duncan’s mom is played by Toni Collette, and her character Pam is a divorced, insecure single mom trying to balance her own happiness with that of her teen-angst-filled son. Pam and Duncan are the outsiders in this beach community as we quickly learn when next door neighbor Betty (Allison Janney) barges across property lines (and personal space) with drink in hand and gossip flying. Feeling further humiliated by his encounters with Betty’s cute daughter, Duncan finally gains a ray of hope thanks to Owen, the man-child manager of the Water Wizz park. Sam Rockwell plays Owen, and quickly becomes a mentor to him by offering him a job and what I call … Water Wizzdom. Of course, Duncan keeps the job a secret from the others in his life, and since they are mostly oblivious to his long absences, it proves again how self-centered the adults are in this little would-be family. The well worn movie signs are all here … we recognize the characters and their struggles, in fact, we all know someone like each of the people that co-writers and co-directors Nat Faxon and Jim Rash present to us. We understand quickly that this is yet another coming-of-age tale with mostly clueless adults, and kids trying to cope on their own. Despite that, this one still mostly works. The writing and acting are such high quality that even though we are living in movie cliché-land, we still find ourselves caring about Duncan and Pam, laughing at Owen, and tossing tomatoes at Trent (Carell). Special recognition to Sam Rockwell. Even though Duncan is the key character, it’s Rockwell’s Owen who recognizes that a little faith and encouragement goes a long way. Behind the facade of rapid-fire banter and laugh-inducing one-liners, Owen is coming to grips with a life of reality and shattered dreams. While never stooping to the typical Hollywood “win one for the Gipper” speech, Owen manages to instill a bit of confidence in Duncan … to the point where he refuses to let his mother pretend everything is OK with Trent. AnnaSophia Robb plays the cute girl-next-door who recognizes potential in Duncan, but the filmmakers never allow this to turn into some ridiculous fairy tale. Instead we get characters who are each flawed, but real and recognizable. While all the typical pieces are present, there is enough crackle to the dialogue and quality acting to help this one rise above the usual muck. It’s a nice “little” alternative to the giant summer blockbusters. Nat Faxon and Jim Rash have shown again that they have a gift for dialogue and now a talent for guiding actors. In this, their directorial debut, they prove that they also have skills as filmmakers. We should expect the next one to be even better!